We found this property very new, clean, well maintained with a helpful staff and a great breakfast menu. We will definitely stay there again when visiting the Orlando area. For the price, one of our best hotel experiences in Florida. This is definitely a family friendly hotel. The continental breakfast every morning was excellent with a great variety. The rooms are extremely comfortable and the beds are like sleeping at home. Very comfortable room; friendly and helpful staff. The sink area could have been closed off from the bed area. Overall, a good place to stay. I'd return. Good Value. Near Universal City & International Drive. Restaurants were not very close, except Wendy's. The 101-room Sleep Inn And Suites Universal Studios is located minutes from some of the major Orlando attractions and provides quality accommodation at an affordable price for both families on vacation and the business traveler. Items included with the room rate at this non-smoking hotel are a Savory Starts breakfast, high-speed Internet access, local telephone calls, in-room coffee, parking, a copy of USA Today and scheduled transportation to Universal Studios Florida, Wet 'n Wild water park and SeaWorld Orlando theme park. There is one meeting room available for business or social functions that can accommodate 40 guests. The property is two miles from the Orange County Convention Center. Other area landmarks and attractions include International Drive which has an array of tourist attractions, restaurants, shops and entertainment areas, the Walt Disney World theme parks, several golf courses, numerous shopping malls, historic downtown Kissimmee and Gator World. All the rooms have a work desk with high-speed Internet access, coffeemaker, refrigerator, microwave oven, telephone with voicemail, television with cable movie and news channels, iron and ironing board, in-room safe and a hairdryer. Handicap accessible rooms are available. This inn has an outdoor heated swimming pool, hot tub, exercise room and a snack shop. The 24-hour front desk has tickets for the Orlando theme parks and has information on area events. Other amenities include copy and fax machines available for guest use, a games room, a coin-operated laundry, daily housekeeping and ice and vending machines. The complimentary breakfast is the only meal served here. Restaurants nearby include a Cracker Barrel, TGI Fridays, the Ale House and the City Walk. 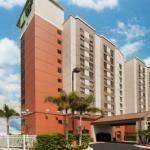 Reasonable rates and spacious rooms are two reasons that many visitors to Orlando will return to this Sleep Inn. There were some minor moans that housekeeping could clean a little deeper but overall the property gets good reviews for its accommodation and efficient and friendly team of employees. The location is good, within walking distance of Universal Studios, although many guests preferred to take the complimentary shuttle and save their walking skills for the theme parks.